I reviewed the 2017 first volume of this series here. 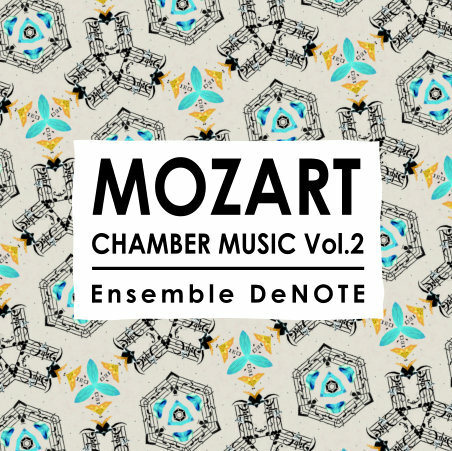 It grew out of Ensemble DeNOTE’s 2016 staged performances of Mozart, part of their Mozart Project Live! It is followed by this similarly imaginative programme of music, with two very different and little-known pieces. The Duo for Violin and Viola in G has an interesting backstory. It is one of two Duos composed in 1783 at the request of Michael Haydn as he didn’t have time to complete a commission for six such Duos. Originally passed off as Haydn’s work, Mozart eventually reclaimed and issued manuscript copies of them in 1788. The G major Duo is a delightful conversation piece between the two equally important instruments. Christian Friedrich Gottlieb Schwencke’s arrangement of the B flat Serenade for 13 Winds (the Gran’ Partita) gives a real insight into the mind and skill of the arranger. Originally written for the unusual combination of pairs of oboes, clarinets, basset horns, bassoon, two pairs of horns, and a double bass, Mozart’s 13-part Serenade was probably commissioned by the famed clarinettist Anton Stadler. It was first performed, in part, in 1784. Its monumental scale, with seven movements, three of which last about 10 minutes, lifted it well above the normal notion of a Serenade of the period, usually considered as little more than background music for an occasion – literally occasional music. Reducing the texture to a string trio, clarinet and piano reduces much of the exotic aural textures of the original, but the more chamber-like performance, beautifully grasped in this recording, give the chance to concentrate on the musical texture. Schwencke was the Stadkantor of Hamburg, succeeding CPE Bach, but he has subsequently managed to escape the notice of music historians. But, on the basis of this arrangement, his skill was substantial. It is not an easy task to reduce such a complex texture, but he manages it well, without relying excessively on the piano to fill in all the gaps. With the woodwind reduced from the original 12 to just one obviously gives a different focus to the sound, but he integrates the clarinet into the overall fabric very successfully, something reflected in this fine performance. Of course, it is still the clarinet that announces the high theme in the famous ‘Amadeus’ Adagio, but it’s role after that is shared with the other instruments on an equal footing. The playing of Ensemble DeNOTE is exemplary. Marcus Barcham-Stevens, violin, Oliver Wilson, viola, Ruth Alford, cello, Jane Booth, clarinet, and John Irving, fortepiano, blend perfectly with each other. The sound of the fortepiano (a copy of a c1795 Walter) is attractively delicate and restrained, but whether this is due to sound engineer intervention, distance from the other players, or just the way it is, is not clear. It was recorded in a Priory chapel in Yorkshire, in a sympathetic acoustic.